Quality Marine debuts commercial availability of captive-bred Yasha Goby, Stonogobiops yasha. Pursuant to our continued efforts to support captive-breeding initiatives, as well as our dedication to remaining a leading source of aquacultured specimens whenever available, Quality Marine is excited to announce we’re adding yet another breakthrough species to our growing list: the Yasha Goby (Stonogobiops yasha). S. yasha is easily one of the most desirable species of goby available to aquarists. Known as the Yasha Goby (or, alternatively, the White Ray Shrimpgoby), this tiny fish is definitely not small in beauty or personality, with its vibrant red and white patterning and its greatly elongated dorsal fin. Like others in its genus, the Yasha Goby associates with pistol shrimps in the wild (most frequently observed with the colorful and commonly available Alpheus randalli) forming a symbiotic relationship wherein the shrimp works to create a burrow, while the goby stands as lookout, alerting its partner when danger is afoot. This interspecies friendship is a charming addition for any reef aquarium, especially smaller tanks, where the antics of this two-inch fish can be more-easily observed. While their charms are not lost on the aquarist, their increasing popularity creates a demand for the charismatic species that strains the limitations of wild-sourced specimens. An elusive and enigmatic species in the wild, to date, it is still only known from a handful of locations. Scattered throughout the West Pacific, from Japan to Vanuatu, it is said to be found in moderately deep habitats, from 15-40 meters. Last spring, a group of undergraduate students at Roger Williams University in Rhode Island embarked upon a series of research projects in hopes of successfully culturing and rearing S. yasha as part of the schools Marine Ornamental Program. In collaboration with The Rising Tide Initiative, the group, led by Joe Szczebak, Brad Bourque, and Dr. Andy Rhyne, experimented with a series of environmental conditions to best induce spawning, as well as observed the role that their symbiotic relationship with A. randalli played in reproduction. Earlier this year, Szczebak excitedly shared that the teams arduous efforts had been rewarded with a monumental breakthrough. Not only had six of their nine conditioned pairs been regularly spawning and laying nests within their synthetic caves, the larvae had begun successfully settling and metamorphosing around 30-50 days post hatch. Their first attempt yielding 38 thriving juveniles; the team continued to make advancements in their techniques and now has a continuous stock of the very first aquacultured Yasha Gobies. Quality Marine is honored to have supplied broodstock for this project back in December of 2014, and were thrilled to see it realize such levels of success. This achievement, coming just on the heels of the Hawaii Oceanic Institute/Rising Tides massive triumph with the first aquacultured Yellow Tangs (Zebrasoma flavescens), and, most recently, their tremendous breakthrough with the UF Aquaculture Lab in successfully rearing the Pacific Blue Tang (Paracanthurus hepatus), is precisely why we support such initiatives and will continue to do so in the future. Each success brings optimism for our ever evolving industry, and we eagerly await the next breakthrough from these efforts. In addition to the Rising Tide initiative, there are a number of other projects Quality Marine proudly supports. Of significant note, our efforts regarding the Banggai Cardinal (Pteroptogon kauderni). Beautiful and iconic, the Banggai is touted for being one of the most popular choices among aquarists, and consequently vulnerable to over-harvesting on such a scale that the National Marine Fisheries Service (NMFS) recently listed the species as Threatened. 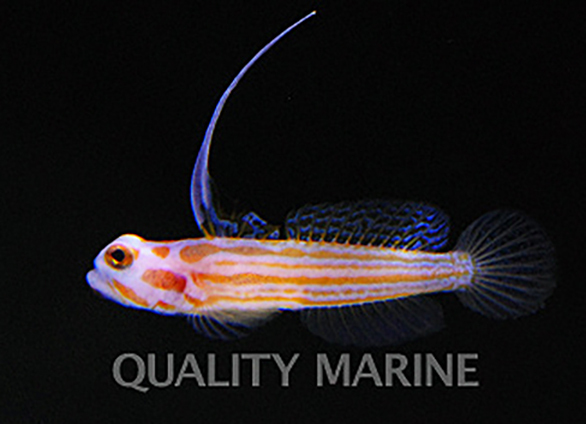 For over 3 years, Quality Marine has only distributed captive bred P. kauderni. Adamant in our stance to provide only the most sustainably and responsibly sourced marine life to the industry whenever possible, Stonogobiops yasha is a species we feel is a valuable addition to the growing list of aquacultured organisms available. While not listed as threatened or endangered, this is a relative newcomer to the trade, and as demand and desirability continues to grow, supplying a captive bred alternative relieves pressure off of the wild population. As they join the ranks among our seemingly endless list of cultured fishes and invertebrates, were very much looking forward to supplying the very first captive-bred Yasha Gobies available to the trade. The robust juveniles have been under the diligent care of our talented husbandry team since their arrival late last week, the first of which are destined for AZA approved aquariums.